is worth as much as if we did it for our Lord. not because we do the work itself, but because we do the work to be obedient to Him. For those of you that are new 'round here--WELCOME!! have my own business, take jobs when I "feel like it". My main job is making my own home and keeping it. 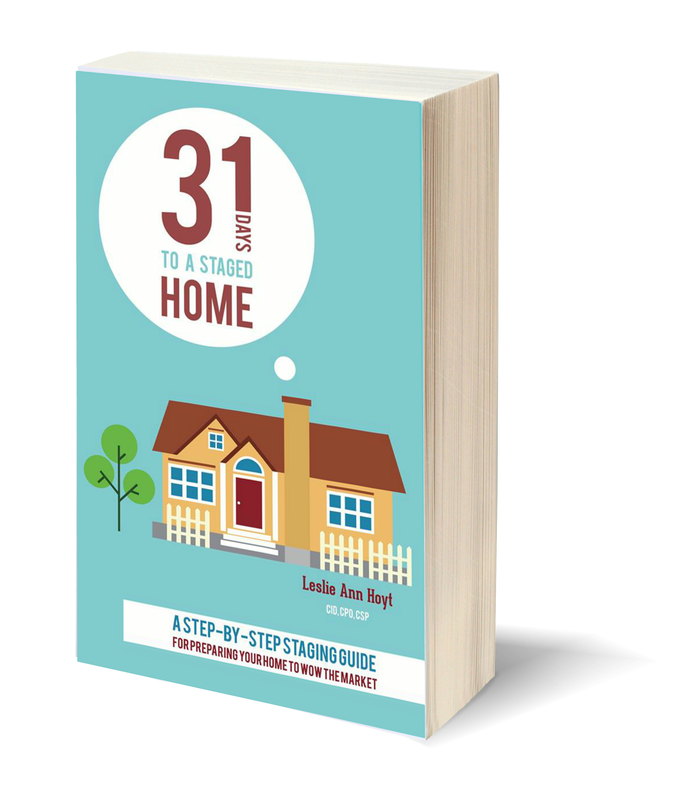 to transform from a home to a house and then back again for resale. Today, we are looking at a Dining Room. that was on the market 2 months before I staged it. The closing papers were signed 3 weeks after that. Now, I love red, and a few of you might like red. But, most people don't. It's a personal color. "I will be painting over that red." is creating a mental "TO DO" list in the mind of the buyer. Not only is red too personal, it is rather dark. A neutral shade is needed here. I always remove everything except the table, 4 chairs and a hutch (if there's room). I also remove all the "small" art and accessories that say "clutter" instead of "chic". Primer, paint, and a day later, and here is the result. created consistency, symmetry, and proportion in the buyer's eyes. The darker shade below the chair rail is the next darker shade on the paint chip. I positioned the chairs to intrigue the buyers into entering the room. It's not practical for every day living, but perfect during selling. (Some cabinet doors from the kitchen that have been painted, are drying on the floor). Ikea "tube" slipcovers were slid over the chairs and secured with napkin rings. 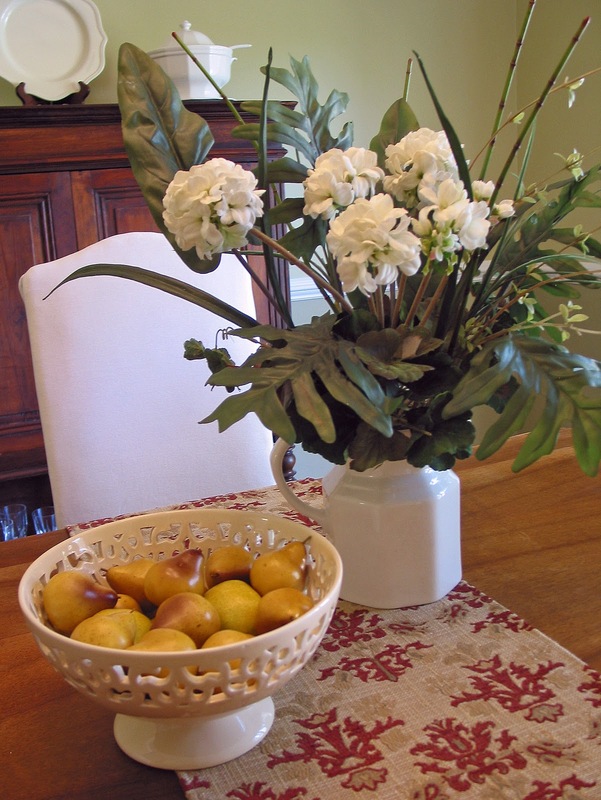 A runner with pizzaz, and a simple vignette are all that are needed for the tabletop. Not every place needs a setting. It appears contrived. 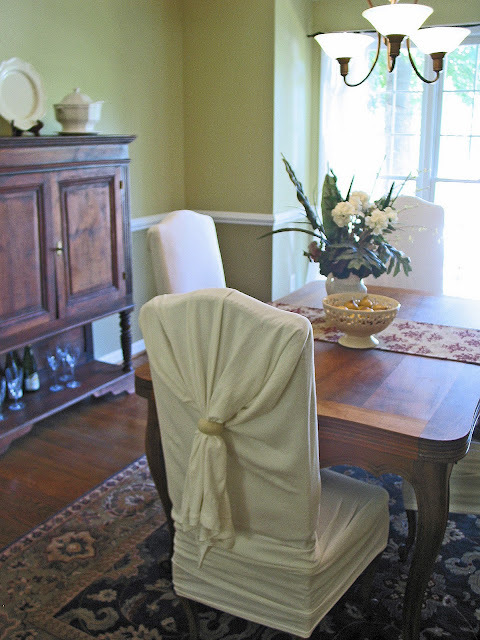 What the Dining Room should suggest is family memories during celebrations and/or entertaining. The rug was moved from the Home Library. Tureens and a platter suggest large holiday gatherings with family and friends. Bottles of champagne (or sparkling grape juice) and stemware suggest intimate celebrations. Clean and polish everything. Table, window treatments, chandelier, silver, windows, floors. Repair anything in disrepair. Furniture to flooring. All trim and doors throughout the house should be the same color. (I prefer to paint them all white). Make sure that this room has a dramatic focal point, by showcasing a unique piece of furniture or artwork. Remove anything personal to your family: photographs and monogrammed items. Group accessories in vignettes of no more than 3 items, varied by height. Make traffic lanes easy to navigate for several people passing through at the same time. Remove one or two leaves from the table if the room needs to appear larger. If the china cabinet is really, really large, consider removing it and replacing it with a dresser or buffet. If the cabinet stays, and has glass doors, remove enough shelves and contents to appear "chic". Group like items together. Allow as much light to filter into the room as possible. Use only white or small patterned china in the china cabinet or hutch and keep the place settings to 6. Pack the rest. If the room is particularly large, create a room within a room. Add a small secretary or small desk. Add a lamp and a box of stationery to the desk. Or bring in a bookcase and an arm chair to suggest a library. Leave no electronic equipment in view. Fantastic job! Well staged and inviting. Wish I could have you come out to Arizona and help me with a few of my problem areas in my new place. Missed reading your blog, while I was "gone", so glad to be back and catching up! Have a blessed week. not because we do the work itself, but because we do the work to be obedient to Him." What a beautiful truth to start your post with. P.S. I'll work on that email thing-a-ma-jig option soon! hugs! You are exactly right. As a buyer, I immediately start subtracting from the value for every red (or similar dark color) wall I see. It is SUCH a pain to paint over! You did a great job, Leslie! 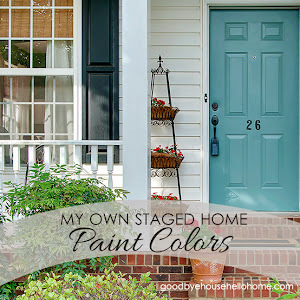 I find it so interesting, the psychology of staging a home. The public wants a home to look a certain way when they are shopping to buy but the majority would never live in a house that looks that bare, neutral or stark. As a designer, it's like left brain vs right brain to switch from designer to stager! The changes made a big difference in the brightness and appeal of the room. You did a wonderful job, Leslie. Great tips, too. Great post and great job on the staging! I am someone that does like red but those neutral colors and the way you staged the room look looks wonderful. And thanks for all those great tips listed. I have a friend who is trying hard to sell her house. I'll be sharing this info with her. Fabulous job and excellent advice. Love this. You covered everything great in that post! The new paint looks great. I love your tureens. I have a small version of the one on the left. I wish I had gotten the bigger one too. Yes, I left it behind. Big regret! What wonderful words to open with today! I am going to print them out and frame them. You truly are a ray of sunshine on this cold, snowed in NJ day. What a difference you made in that sellers dining room. It always amazes me how tweeking just a few things can have such a big impact. A beautiful transformation!! I love the simplicity of it...getting rid of the clutter! Great job! Leslie, wonderful changes and great tips for selling. 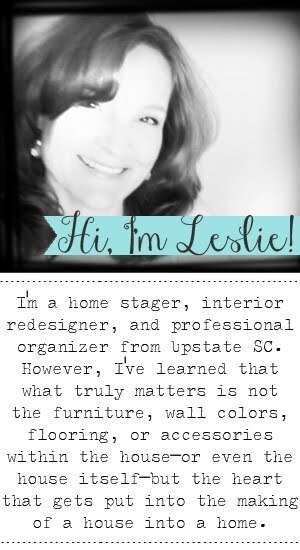 Hi Leslie, What a difference! Great job. I used to stage and I'm impressed you were able to get the seller to repaint -- but honestly, the chairs with napkin rings and some fabric over them? No. What's funny about this house is, there was a home stager that came along with the "package" that the Realtor offered. This stager during the walk-through consultation with the homeowners (who are now friends of mine) said nothing about painting any rooms, updating the dark wood, nor did she even notice a few basic red flags that should have been addressed immediately, like the red in this dark dining room. After a few months of their house not selling in the "staged" condition, I was called on to actually stage it and remedied the whole house in 2 weeks, and it sold 2 weeks later for much more than listing price. And, I admit that it is rather odd, but that is not actually fabric simply draped over the chairs and held in place with napkin rings. Yes! Finally something about bad credit home equity loan. skills as neatly as with the structure for your weblog. Either way keep up the nice high quality writing, it is uncommon to look a great blog like this one these days. be printing labels in no time! Thanks for dropping in!